To evaluate the technical and clinical success, safety and long term results of percutaneous transluminal angioplasty/self-expandable nitinol stent placement of infrarenal abdominal aorta focal lesions. 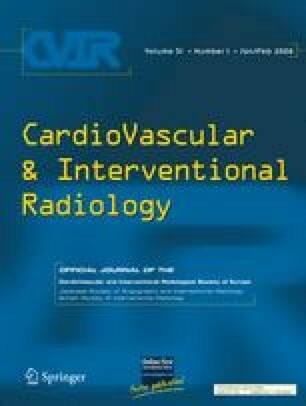 Eighteen patients underwent PTA of focal atherosclerotic occlusive disease of distal abdominal aorta. Two symptomatic occlusions and 16 stenoses in 10 male and 8 female patients (mean age 68.2 years) were treated with primary self-expandable nitinol stent placement. Primary self-expandable nitinol stent placement was technically successful in all 18 procedures; clinical success was achieved in 100% of patients. No complications associated with the procedure occurred. During the 49.4 months of mean follow up (range 3–96, 4 months) all treated aortic segments remained patent. Endovascular treatment (primary self-expandable nitinol stent placement) of focal atherosclerotic lesions of distal abdominal aorta is a safe method with excellent primary technical and clinical success rates and favourable Long term results.